I’m a huge fan of churches. Everywhere I go, I try and tour as many as possible. Here’s a listing of some of the ones in San Cristobal, and click here for a Google Map with these locations on it. Constructed around 1528, this cathedral sits on the main square. The beautiful yellow color is most stunning around sunset. It was renovated in the 18th century. The plaza in front of this cathedral is a gathering place and is always full of life. This is a can’t miss place that is very representative of the city. 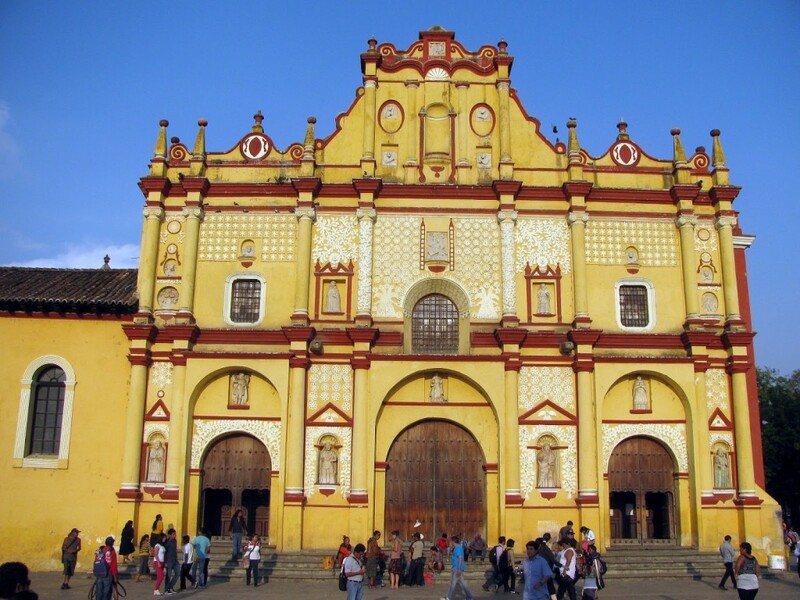 It was a picture of this cathedral that spurred my interest in traveling to San Cristobal. 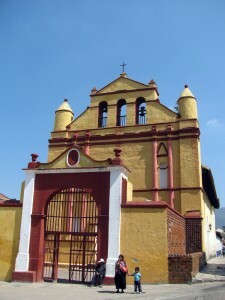 This small church faces the parque central, and is behind the main cathedral. Originally built to serve the indigenous population, it is much smaller and simpler than other churches. It is the only church in the city which retains its original form. It’s located at the corner of Real de Guadalupe and Avenue Ultrilla. I wasn’t able to visit the inside of this church as it didn’t seem to be open as regularly. Another sites indicates that it now serves as a Diocesan museum, open limited hours. This is church was built in 1547 by the Dominicans. The baroque facade is covered with carvings. Restored in 2006, at the time of my visit, it was also covered with netting, no doubt to keep the pigeons off it. The interior is beautiful as well. This church is constantly surrounded by a huge craft market, at which the local indigenous people sell weavings, textiles, and other goods. Located on Ave 20 de Noviembre, between Guatemala and Nicaragua. 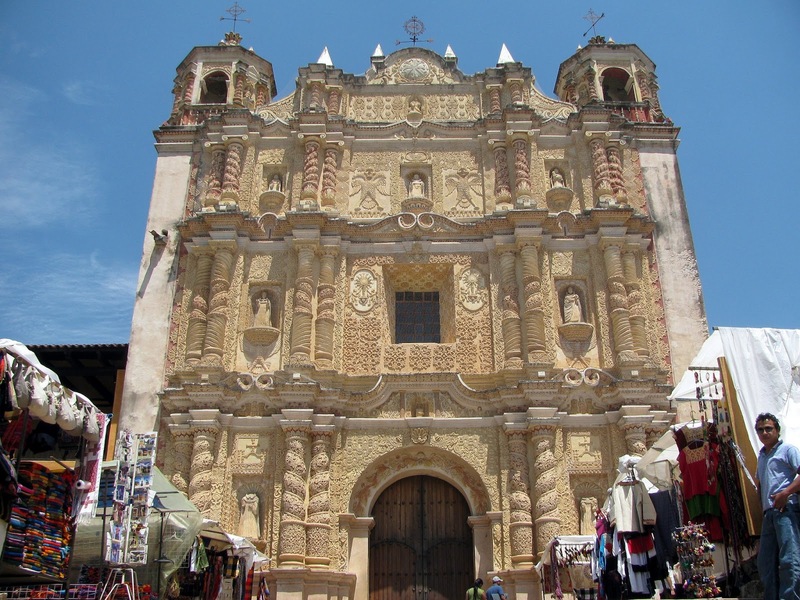 Located near the Templo y Ex-Convento de Santo Domingo de Guzmán, this church was founded in 1712. This church was difficult to photograph, as it is also surrounded by the large artisan market that envelops several blocks. 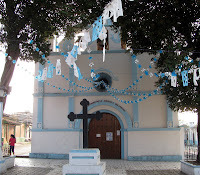 The church is located on Utrilla near Comitan. The style is baroque. 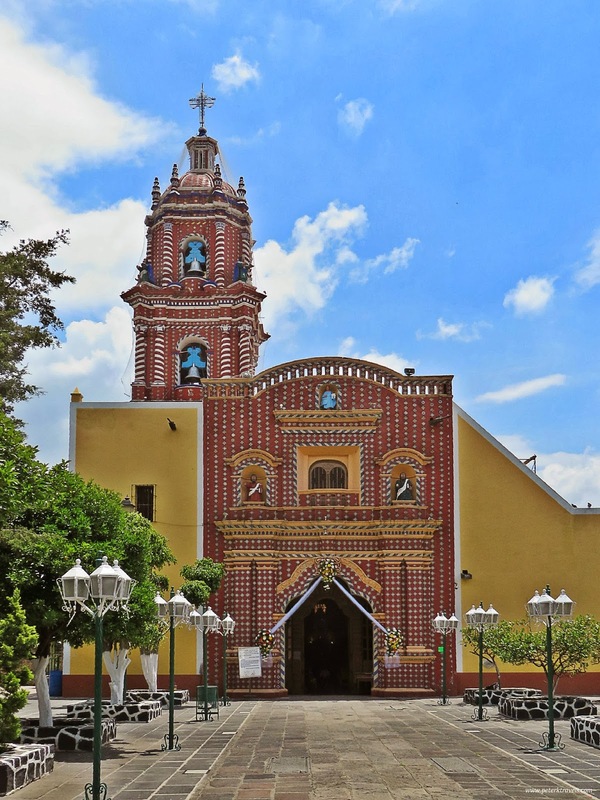 Located on Diego de Mazariegos near 12 de Octubre, this church sits on a beautiful, well landscaped plaza. The church has been heavily renovated over time. The Convent next door is now open as an Amber Museum. Entry to museum allows you to see more of the convent area. The church was being repaired during my visit, as is evident from the concrete patches on the front. 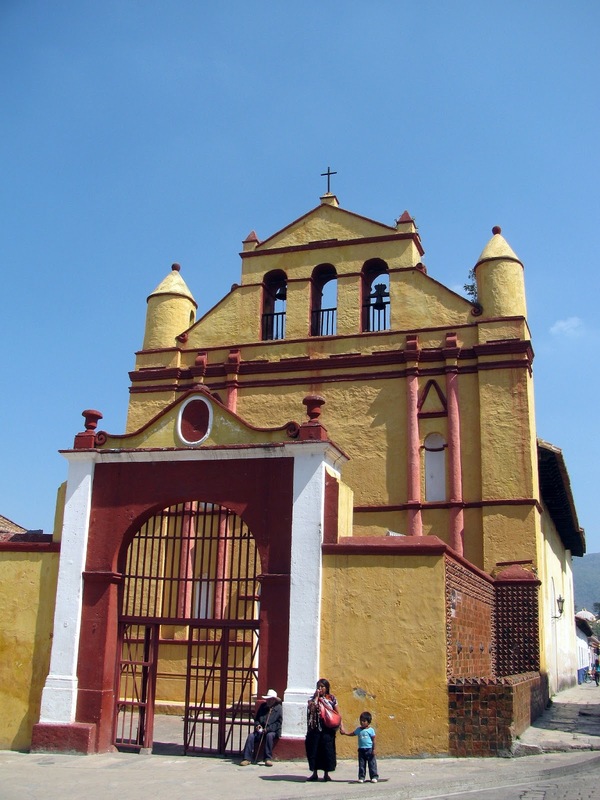 This lovely small church can be reached by climbing a series of 240 stairs up a small cerrito (hill). If you’re not used to altitude or out of shape, you can take a taxi which will drive up the back side of the hill. 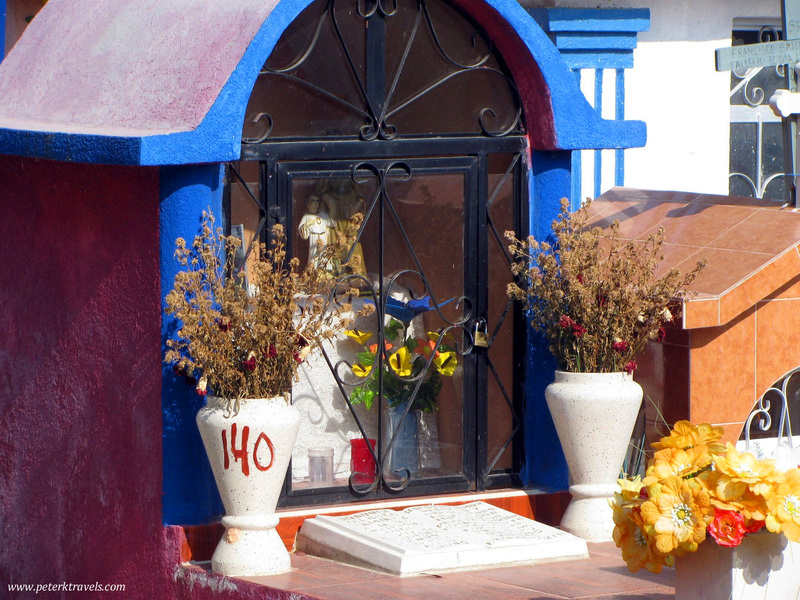 Located where Hermanos Dominguez dead ends into Ignacio Allende. The view is superb. The church dates to the 18th century. Another church which requires climbing many steps is the Templo de Guadalupe. Reached by walking west on Real de Guadalupe. This church is visible from quite a distance due to its height. Built in the 1834, there are 79 steps leading to the top of the hill. The view is excellent, it is well worth a visit. One of my favorites is the Templo de Mexicanos. A beautful, bigger church with red and white paint. No background information is given in any guide I have. Has a date of 1904 on the front, but that’s likely for a renovation or addition. It seems much older than that. Located on a small plaza on 16 de Septiembre and Nicaragua. 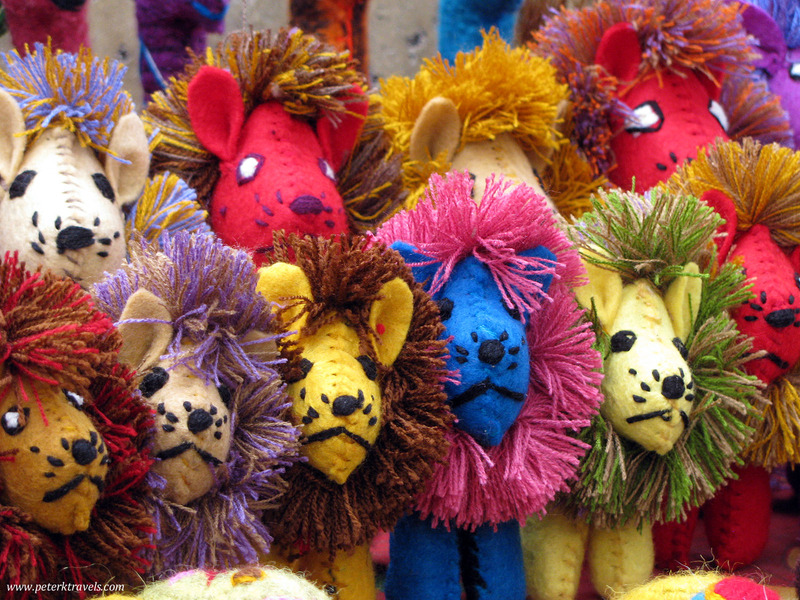 Located on the plaza de el Cerrillo, which could be easily found at the corner of Comitan and Dominguez. This is a small church, not far from Santo Domingo. It has the date of 1890 written on it, which is when the facade was built. The original structure dates to the 1700s. Founded in 1577 by the Franciscans, it is located at Insurgentes and Heroes Ninos Dominguez. It sits on a small plaza which often has food vendors. It’s a pretty stark facade. The interior is beautiful. An interesting blue and white painted neo-classical church, Templo de Santa Lucia is located on Insurgentes and Obregon, just a few blocks south of the Templo de San Francisco. It was built between 1884 and 1892. Located due west of La Merced along Mazariegos, this one wasn’t even on the map. It dates to the 18th century. It’s surrounded by a beautiful series of gardens, and the entire plaza was locked when I first arrived. I came back later, around 6:00 p.m., and it was open. I had to ask a local man for the name. Well worth a visit. 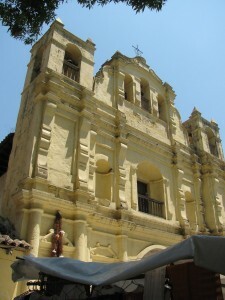 Located on Ninos Heroes and Cresencio Rojas, this church may also be known as the San Agustin church. The design is somewhat different. It has a small plaza out front. It now serves as an auditorium. Located on Hermanos Dominguez and Hidalgo, this is attached to the Arco del Carmen. Fronted by a beautiful garden, this is an interesting church that dates to the 1600s. 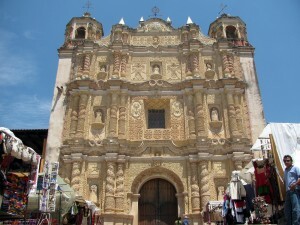 The attached arch shown to the right is one of the most photographed symbols in and around San Cristobal. Located on the Pan American Highway where Juarez and Carranza meet, somewhat south-east of the Centro area. This is a small, rather unremarkable blue and white church which sits on a concrete plaza near the highway. It wasn’t open when I visited, and I don’t have much more information on it. Dated 1946 on the front. Found on a small, leafy plaza south of el Cerrito, I know nothing about this church. I found it while wandering around a mostly residential neighborhood. The name is a guess based on what is written on the front. 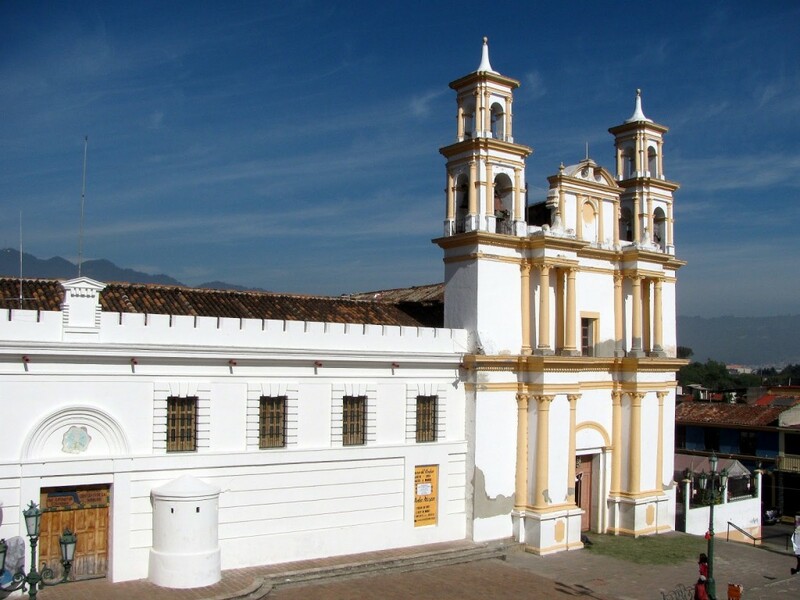 2 Responses to "The Churches of San Cristobal de las Casas"
Thanks Peter for taking the time to photograph and learn about all the beautiful churches in San Cristobal de las Casas. We are spending two months here, and as you’ve clearly shown, the architecture alone is worth the trip. There seems to be a church around every bend, and as you’ve demonstrated, many are very ornate, brightly colored and fun to look at. You’ve obviously done some exploring! Now, if you can explain about how the fireworks relate to the religious observance, that would be helpful. Some nights the explosions go on till very late in the evening and some mornings, they start at 4:00 AM. We are located not to far from the Templo de los Mexicanos and are not getting as much sleep as we’d like. I apreciate your work, in my travels I photograph many churches and don’t always remember to note their names. Your site is very well produced!